Every year, it seems the WWE 2K series takes two steps forward and four steps back. There is always a solid foundation and great ideas that prove that Visual Concepts and Yuke’s know the WWE product. However, executing has been a struggle. While WWE fans may be content with what the series’ has had to offer, it’s always hard to recommend it to someone outside of the WWE fanbase. The latest entry, WWE 2K19, attempts to right those wrongs but just barely makes enough improvements to really make a difference. The goal of this particular entry, as stated by the game’s Creative Director, is to “make the game fun again” and it does in a variety of ways. How it doesn’t is its gameplay. WWE 2K19 does improve upon last years in some significant ways. Overall, the action just feels a bit quicker; the animations seem to be snappier and the movement speed is a bit faster. It’s not much but it does make the experience of playing the game enjoyable. Some great implementations that further this notion are the overcharge and payback abilities. These special moves – which you’ll have two to use during a match – help you turn the tide of the match if you’re having trouble gaining momentum. There are a number of different abilities to choose from that range from actual moves, like the low blow, or stat buffs. 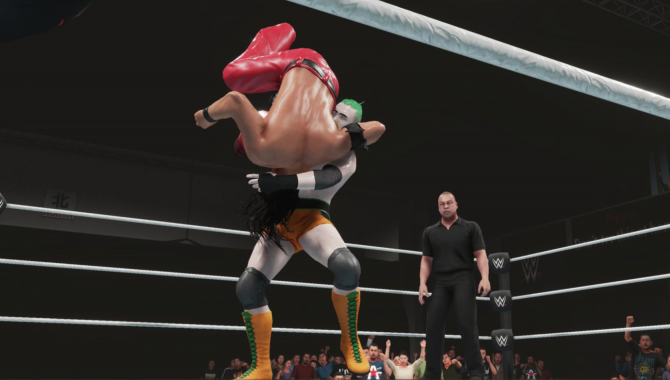 The abilities I used for my created superstar were the auto-reversal and an instant finisher; the auto-reversal ability lets the player automatically reverse any normal move while the instant finisher will grant the player a finisher at any point during the match. These abilities were not only useful in a practical sense but also made the matches more interesting. It gave me more options to defeat my opponent rather than to solely rely on my ability to execute successful reversals, special moves, and finishers. At the end of the day, the gameplay is exactly the same. It is the convoluted controls the WWE 2K games are known for. It still has the semi-arbitrary health bar. There is still some inaccuracy to grappling and striking. Everything that was questionable about the gameplay is still there which is unfortunate since the features WWE 2K19 introduce and bring back make for a great package. This includes the comeback of the 2K Showcase. This year, Daniel Bryan takes the spotlight as you play through some of the popular superstars most popular and integral matches of his career. Bryan’s career, in particular, goes well with the mode; there is a natural progression, conflict, and conclusion that has been built up throughout the years that could intrigue just about anyone thanks to its documentary format. Each match will begin with a video featuring the actual Daniel Bryan talking about a certain moment in his career. It will then be followed by, what would be considered, the pinnacle for that particular moment. It is really neat to see how all the different versions of Daniel Bryan play since his moveset and style change throughout the years. Where this mode falters is with its objective system. During a match, you will be tasked to complete certain objectives to progress to the end. This may be as simple as getting an opponent’s health down or as complicated as performing a specific move on a certain body part. I do believe this does allow the player to learn new techniques and diversify the gameplay if the player knew how to do those moves in the first place. The only tutorial you are really given is when you begin your first match. perform a certain move, and a prompt pops explaining the move you have committed to. Those tutorial prompts will only pop if you commit to a certain move and only in the middle of a match. WWE 2K19 has a deceptively complicated system that warrants a practice or tutorial mode similar to the ones found in fighting games. That way, the next time I get an objective like “perform a Limb Target Attack from a standing grapple,” I instantly know what to do instead of going through menus to try and find out how. It is a big enough issue that could shoo away a newcomer to the series. The MyPlayer mode streamlines many of its features from last year. The MyPlayer Wizard brings the fighting style count to just five, however, you are able to choose between two sub-styles within one of three skill trees for your created superstar. The primary skill tree you’ll use to upgrade your superstar is simply called the MyPlayer skill tree. I am not exaggerating when I say this is one of the biggest skill trees I have ever seen in a video game. Instead of allocating points into specific attributes, you will instead unlock nodes in the skill tree that will give you points in certain areas as well as new abilities and overcharge points. The secondary skill tree is the sub-style skill tree which lets you hone in on to a specific style within the one you have already chosen. For example, I chose the cruiser style and decided to put my points in the luchador sub-style. This will also give you more attribute points in certain areas as well as overcharge points. The overcharge points will be used in the third and final skill tree, the overcharge tree. Using overcharge points from the aforementioned skill trees, you will be able to upgrade certain overcharge abilities improving its damage, the amount of time it is active and more. While this form of customization doesn’t allow you to fully personalize how you want your points used, it does make you put the points where you should to really create a wrestler within that fighting style. The progression system behind it does seem to make the process of making your character stronger a bit longer but since you are always leveling and acquiring points, it doesn’t feel like too much of a slog. This character will be used in all of the modes within MyPlayer, including the new MyCareer mode which takes the beloved mode in a different direction. Instead of the typical route of starting at the WWE’s developmental league NXT and moving up to the main roster, you will play through a linear narrative that begins with your character living in a van and wrestling for an indie promotion known as BCW. I wouldn’t say the story told is expertly crafted but some of it does feel like a storyline the WWE would tell. It’s a fun romp that includes the best depiction of Braun Strowman, with him curling rafters before his match. A huge improvement to the MyCareer mode is the addition of voice over. Finally, everyone has a voice including a few of the WWE superstars. There are some inconsistencies with the voice-over audio and some lines of dialogue do not contain any voice over but it was a much-needed addition that the series has been without for years. Another bright and shiny light in the MyPlayer mode, as well as in the new is the new Towers. Similar to the towers from Mortal Kombat, you’ll fight a few wrestlers set within a theme until you complete it which will give you a few rewards ranging from loot pack currency to new outfits for your created player. Towers will vary in difficulty as well as the type of stipulations a match will have and are also timed. This is where the “make the game fun again” mentality really shows – well, there is the big head mode and the Minecraft inspired block bodies too. It is actually fun to play through these Towers making it a solid addition I hope stays in next year’s WWE 2K game. All of the modes that have returned from WWE 2K18, like Road to Glory and WWE Universe, are all very similar to last year’s which isn’t a bad thing. Road to Glory is still a great mode that would be great if playing online was consistent; sometimes I would play and there would hardly be any lag and other times, the input would lag by at least a full second. WWE Universe is still a fun time sync that lets you craft the WWE product you want to see by letting you customize just about every facet of the superstars and shows they’ll be showcased on. The customization doesn’t stop there. A feature the WWE 2K games have always had that really excels is its creation suite. You can create just about anything at this point. If you really wanted to play as the Young Bucks, you probably could. Heck, anyone you think is missing from the roster has already been created – I’m looking at you Tommaso Ciampa – and you can download them for free. If you have any creative bones in your body, you could spend days just creating the goofiest or most authentic wrestlers you can think of. If that doesn’t scratch your creative itch, you can also make your own championships and Money in the Bank briefcases. I can confirm you can make a denim championship belt with engraved wooden plates so just about anything is possible. This puts me in a weird spot. For better or worse, I really think WWE 2K19 really captures the current WWE product very well while also commending those who have made their way to the squared circle in years past. It presents some solid ideas that are really needed to make this series worthwhile. Unfortunately, like almost every iteration before this, those ideas are not executed well. This is primarily due to gameplay. While there are some great implementations like the payback and overcharge abilities, it is still the same ol’ gameplay you know from the series. Yet again, if you are into the WWE, you may find some enjoyment. Anyone outside of the WWE universe may find it hard to hit the ropes on this one.